Despite the events below, we swear we really do like to drink good beer sometimes. Shaw: One of the best parts of Cain’s is that they’ll sell you Budwesier a six-pack at a time, plastic rings and all. We walked in and headed straight to the bar to pick a few up. Good thing, too. The lady working the line told us they only had five six-packs left, so the four of us each bought one. And then just to be safe, we went back and got the last one a couple of minutes later. Robert: Not only does having a six-pack at the ready mean you don’t have to go back to the bar and miss part of the show, but I imagine this is what it must feel like to walk around a ‘70s beer bust barn party. 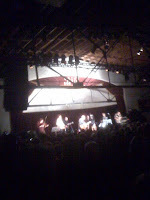 Tonight was Elvis Costello’s last night on tour for his country album, Secret, Profane & Sugarcane. The ex-Angry Young Man played a lot of songs from that, as well as treated us to Americana takes on favorites like “Mystery Dance,” “Everyday I Write the Book,” and, of course, “Blame It On Cain.” It was a pretty fantastic show, and “The Carnegie Hall of Western Swing” was the perfect venue for it. Shaw: With a band that included two guitars, an accordion, stand-up bass, dobro and fiddle, it was like hearing a country-flavored Elvis Costello cover band with the real Elvis Costello singing. Different, but incredible. Rocking a purple fedora, Mr. Costello looked very dapper -- though at one point, the green cast of the lights plus his hat and the thick frames of his glasses made him look like the Riddler. Robert: Maybe Elvis Costello really is an International Art Thief after all. Shaw: After the show, we decided to grab a quick beer at the next door to regroup and figure out where we should go from there. However, since The Soundpony had $1.50 Natural Light draws and some old school video games, we ended up staying awhile. Robert: I took honors on Ms. Pac-Man and Moon Patrol, and Ryan dominated us all at Galaga. The Soundpony also has a Donkey Kong machine that even features the option to play the rare Donkey Kong 3. Jeff, Ryan, Jeremy and I came here when we went to Cain’s to see Wilco last year, stopping in during happy hour, which lasts from 3 to 9 p.m and includes a free hot dog for every $4 you spend. That’s right -- a six-hour happy hour with free hot dogs. KC bars, please take note. 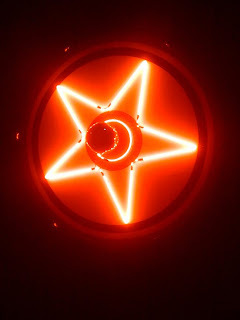 Shaw: The Soundpony is a cool bar. But man, that is a truly awful name. I'll also give cheers to the music selection, but jeers to the bartenders who used the microphone behind the bar to subject everyone to their painful vocal accompaniment. 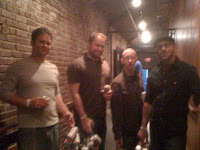 Shaw: We left The Soundpony to go wander around downtown and look for some more substantial eats. But as it was after midnight and most places had stopped serving, we ended up calling a taxi to take us back to the QuikTrip by our hotel. 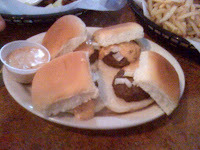 Robert: Ah, QT -- land of delicious roller-grilled foods. I got a burrito and a chili cheese taquito dog. Seriously, they’ve got to be just spinning a Wheel of Random Ingredients to concoct these new cylindrical delights. 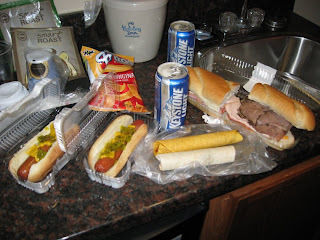 Shaw: I stayed on the less adventurous end with two hot dogs for $2 and a 99¢ bag of Fritos. Without the availability of Chicago dog fixings or sauerkraut, the only proper way for me to have my hot dogs was with mustard and relish. No ketchup shall defile my hot dogs. Nor shall catsup, for all the Hunt’s fans out there. Robert: I was a little disappointed there wasn’t even a single egg roll to be found on the grills, though. I do love some late-night Chinese food. 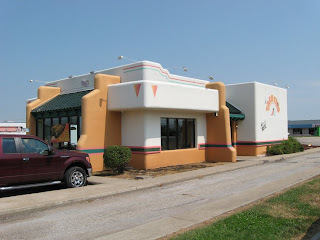 Next time on Lunch Blog: What does it take to get a Whatafarm in Tulsa? For the record, when listening to Sirius XM's Hair Nation, Jeff can name that tune in four notes or less. We’d been counting down the minutes to this road trip since May, when Jeff and Ryan told us that Elvis Costello was going to be playing Cain’s Ballroom in September. First stop -- meeting up with the Brothers Pfannenstiel in Topeka. Robert: We decided to rendezvous here so we could grab a little bit of lunch. Plus, I’ll take just about any chance I can to get a Taco Tico combo burrito. 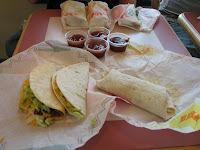 We also each got a soft flour taco and a crispy flour taco. Shaw: As soon as I bit into my crispy flour taco, it shattered and sent half the contents falling onto the tray. So basically I started out with a taco and ended up with nachos. 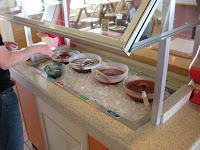 I will say this -- Taco Tico’s sauce bar is pretty fantastic. In order of ascending heat, they’ve got Mild, Green Chile, Hot and Volcano. My favorite is the green chile. Robert: Please note that Taco Tico’s Volcano Sauce is not to be confused with Taco Bell’s cheese-based Lava Sauce -- even though Volcano Sauce looks more like actual lava than Lava Sauce does. Mind-bending. Shaw: Once we got to Tulsa we checked into the hotel and enjoyed a couple of bottles of Jeff and Ryan’s awesome homebrewed IPA. Then we caught a taxi downtown to The Hunt Club to get some dinner. 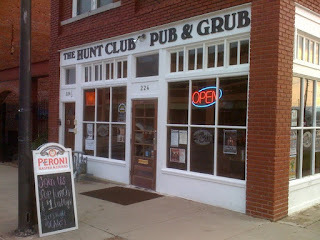 We’d found out about The Hunt Club on the Cain’s website, and it’s just down the street from Cain’s itself. Robert: Some Juggalos were milling around the storefront next door, which seemed kind of weird since Insane Clown Posse doesn’t play Cain’s until October. Shaw: Anyway, we went inside and The Hunt Club turned out to be a cozy little place. 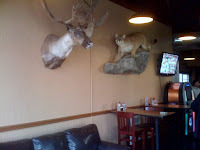 Lots of taxidermy on the wall. Our server came over and told us the special was $1 Busch and $1 Choc Beer Waving Wheat. Robert: Having never heard of Waving Wheat, we asked our server for the scoop. All she could tell us was that it was only a buck because they were, and I quote, “Trying to get rid of it.” So we ordered four Buschs. Shaw: Checking out the menu, we decided to get a couple of orders of queso sliders and fries, plus a dozen tequila lime wings. We took it as a bold statement that The Hunt Club doesn’t even offer a buffalo option. Robert: We also ordered another round of beers, but there were only two Buschs left in The Hunt Club, so Ryan and I sucked it up and got Waving Wheats. Turned out to be not half-bad. Kind of spicy. Couldn’t figure out what was going on in the picture on the label, though. It looked like it was the PC guy from the “I’m a Mac” commercials lost in drunken admiration of his beer, while his Native American traveling companion stood nearby, apparently wearing a straitjacket. Shaw: Other possible scenarios -- the PC guy is attempting to hide the Native American from a bloodthirsty posse by dressing him in drag. That’s actually his withered mother, and she’s clearly annoyed with her son's love of beer over the ladies. Or maybe that’s his wife, sneering disdainfully as he indulges in his only cheerful escape from a loveless, wind-swept prairie marriage. 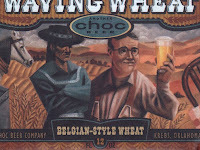 Robert: Then we actually read the label and found out it was a guy named Pete who was down on his luck and decided to start brewing beer using a recipe borrowed from the local Native American tribe, the Choctaw. Interestingly, I think that’s how Jeff and Ryan got started brewing, too. Shaw: I like my theories better. Robert: Our food came out, and for the most part it was fairly blah. 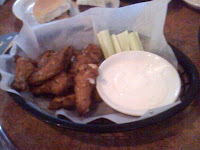 The menu said the tequila lime wings were baked, so it wasn’t that I was expecting them to be fried, but they didn’t taste much better than the frozen kind you can get at the grocery store. The fries, also baked, were soggy at best. Shaw: I can’t for the life of me figure out why The Hunt Club doesn’t have a fryer. Surely it’s not due to health reasons, since the queso sliders are just on the right side of being o-slathered in spicy, cheesy goodness -- making them unsurprisingly the best part of the meal. Really wish I’d tried the Frito Pie. While we were there, one of the Juggalos came inside and announced, “We mean you no harm,” and did a quick sweep of the bar before leaving. Robert: Watch out, Juggalos -- next thing you know, you might end up stuffed and mounted on The Hunt Club’s walls. Next time on Lunch Blog: Elvis Costello, old school video games, and rolling food. You're listening to Radio Tallboys. Getting ready to drive to Tulsa with Shaw and the Brothers Pfannenstiel to see Elvis Costello at Cain’s Ballroom tonight. I’m sure at some point we’ll hit Whataburger. Anyway, here’s my road mix, with links to most songs except for a few local and indie things I couldn’t find online. Please dig in, if you like.